Finance and legal offices have that particular glossy, bold feel to them that makes scruffy visitors feel like foreign contaminants. It’s an unsettling feeling, to read wealth and power in every fibre of décor. 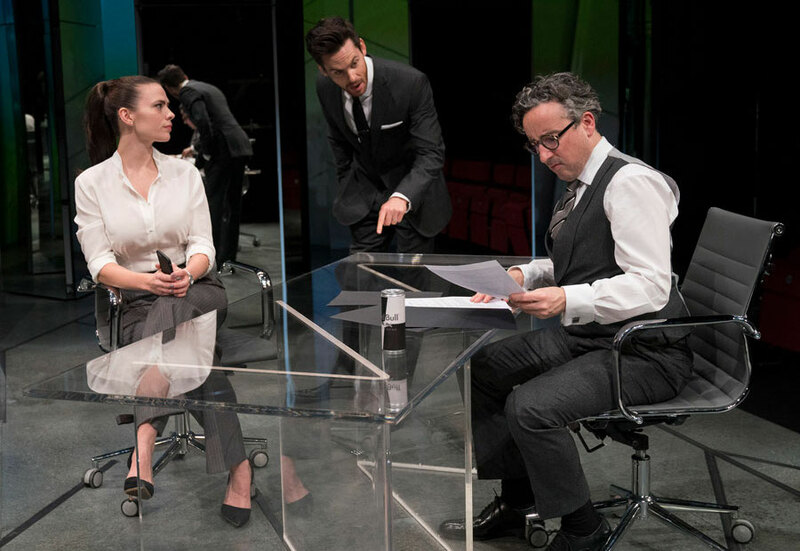 And the set at the Hampstead Theatre for Dry Powder certainly evokes that look: a thrust stage minimalistically set in monochrome, with a sleek glass desk, two modernist chrome office chairs, and a hall of mirrors backdrop. All the space needs is a secretary with a headset to greet me, some fake orchids in blown-glass vases, and a large flatscreen playing CNN on mute and it could have functioned as an actual office. But despite appearances, there wasn’t much about Dry Powder as a play that truly gave me that squirmy unsettling feeling. Constructed as a satire about the ins and outs of a private equity firm buying out a humble Californian luggage company, Landmark, there should have been plenty of reasons for me to feel uncomfortable, or to laugh at my discomfort. Is it 2008, and KMM Capital Management is planning its Landmark buyout, showing its strength and the prowess of American investment in the midst of major economic collapse? Or is it 2011, and KMM Capital Management is showing its tact and power despite the Occupy Wall Street protests going on in the streets below? Eh, maybe it’s 2018, and President Trump’s newest tax bill is presenting delicious opportunities for private equity to invest without getting slapped with income tax. It’s never quite clear when we are with Sarah Burgess’ play. All we know is that CEO Rick (Aidan McArdle) needs a big profitable buyout that shows he has compassion for the little guy, given that he just threw a lavish engagement party on the same day his equity fund laid off thousands of supermarket-chain employees. He needs the good public image in order for investors to trust him again, but he also needs the capital. His firm partners, the calculating Jenny (Hayley Atwell) and the nice-guy Seth (Tom Riley), have opposing ideas for how Rick can rise from the ashes of his mistake, but both options rest on buying out Landmark at a bargain price. Jenny is absolutely certain – she made her analyst run numbers until he was hospitalized from overdosing on Adderall – that stripping the company and outsourcing its production to Bangladesh will guarantee the highest return. ‘But, but…’ Seth reminds us with wide, shining eyes, keeping the company California-local will still be profitable, and will create growth and protect American jobs. Money or morals, which has more value? Once this all-too-familiar premise is established, the play never really goes beyond it. Atwell, Riley and McArdle all do well with the material they’ve been given, but their simplistic, opposing methods make them function less as foils and more as talking figures for the money versus morals debate. Back and forth, back and forth, Seth and Jenny swivel in their chairs and take bourgeois pot-shots at each other. Atwell and Riley have a great, stilted rapport, with Atwell’s sharpness countered by Riley’s smiling, gee-wiz demeanor. They insult each other about their yachts, that Seth only made it into Yale instead of Harvard, and who scored the highest on the GMAT. And somewhere in there, like spoiled children, they also argue ad nauseam about whose plan will be the best. Like the Paul Ryans of the world who think that the American middle class salary is a mere $450K, these characters are ridiculously easy fodder for satire given the absurdity of the discrepancy between their world and that of the rest of us. But Burgess’ toothless and ambiguous humour makes the target of satire unclear, and doesn’t really say anything that Hollywood films of the same ilk haven’t already said. Jenny’s rigidity, her high slicked-back pony-tail, coldness and obsession with numbers over emotions may caricature the heartlessness at the core of finance, but her behaviour is constantly rewarded by both the characters and the plot. Landmark owner Jeff (Joseph Balderrama) tells Seth with a proud swagger that he has Diamond status on Delta Airlines; Seth blinks hard a few times before he realizes that Jeff is trying to brag about his wealth. There’s class critique buried in there somewhere, but it’s certainly hard to find. What I found most confusing was the play’s pivot-point in which the little guy suddenly seems dirty for choosing his interests over his company, and Seth becomes the fallen hero for attempting to protect the common American people. It’s hard to have sympathy for the suddenly-gone-soft compassionate equity investor, when we know he’s a Yale-educated, yacht-driving, ex-Goldman and Sachs employee whose business is playing with dry powder – excess money in the millions that 99% of the public will never even see. Yet the play rests on sympathies for Seth, and that, despite everything else, is what made me uncomfortable. Dry Powder is on until 3 March 2018 at the Hampstead Theatre. Click here for more details.